Family, friends and fun make forever memories! Key Largo’s coastal setting beckons from inside your marina-front villa as you enter through the front door with a spectacular view across Mariner’s Club private yacht harbor out to the Atlantic Ocean. 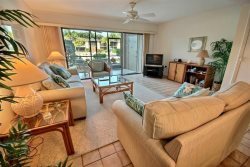 Over-sized sliding glass doors open onto the covered lanai from the spacious and elegant living room and the master bedroom and gives you idyllic views of the days boating activities from this ground floor villa. 115 Mariners Club offers an open floor plan for ease of entertaining and interacting with your family. Whether cooking up something special in the well-stocked, well-appointed kitchen, featuring high-end stainless appliances, striking wood cabinetry topped with a deep-toned lux granite, relaxing around the large dining room table, which seats 6 comfortably with extra seating at the breakfast bar, or catching the game on the large flat-screen TV in the living room or simply shutting off all the electronics and get back to the basics and share a rousing board game…there’s plenty of room to make the forever-memories you came here for. Villa 115 offers 2 formal bedrooms and converted the den into a 3rd bedroom (no closet) to sleep 6 comfortably in beds. (Maximum allowed occupancy is 8. Please see Terms and Conditions for maximum occupancy definition.) Each of the two formal bedrooms have private ensuites and the main living area has a two-piece half-bath (toilet and sink) for guests. Understanding that some guests may need to conduct a little work while on vacation, the highest Wifi speed is offered at no cost to you. The master bedroom features a king-size bed, large flat screen TV, a luxury ensuite with spa tub, glassed shower and a separate toilet and bidet. Guest bedroom 1 has a king-size bed, flatscreen TV and a full ensuite bath. Guest bedroom 2 is the converted den and has two single beds and flat screen TV. FREE WiFi Internet! The fastest available! Very helpful when original unit was flooded and unavailable moved us to different unit. Called maintenance about blinds not closing and they did good job resolving issue would have been nice if they had informed us this problem was already being taken care of when we checked in. MGR RESPONSE: Our apologies...the office staff that perform the check-ins do not coordinate maintenance so they are not always in the loop as repairs are scheduled and in process. We had a very good experience with Barefeet Rentals and they were very accommodating with my after business hours arrival. It was a great place with a great location. Top notch. This was an amazing place to spend a few days (which was our case), a week, or even a month. Everything is just as illustrated in the pictures, and the view off the back is even better. Being 5 or 10 minutes from everything we needed was awesome as well. Would definitely consider renting this specific place again. Thanks for everything! Excellent. Barefeet met or exceeded all of our expectations. The property was very clean and there was a lot of space to comfortably accommodate our party. Visit Island Grill and Di Giorgio's for some great food! The view of marina and ocean. The large pool was awesome! My son also enjoyed the exercise room too. Our rental was spacious and more than met our needs. Plenty of towels for everyone and extra sheets helped too! We did have an issue with one master bath sink that was backing up and maintenance didn't come for a couple days. The only problem with checkout was that the cleaning crew came before 10. -------------------------------------------------Manager Response: Our apology for the delay...we do our best to respond same-day...thank you for your patience at our busy time of year! Snorkeling at pennekamp. Charter fishing with Fin Razer. Eating at the key largo fisheries, big chill, island grill and fish house. Taking a tour of island dolphin care and swimming with dolphins at Dolphins plus. Very positive but it would be nice to be able to just leave the keys in the condo at checkout. Loved the porch area. --------------------------------------MANAGER'S RESPSONSE: Call us old-school but we really like that face-to-face with our guests. We like to greet you on arrival and answer any questions and connect again on departure to make sure everything was to your satisfaction and hear about the fun stuff you got to do! Your feedback on your visit and the accommodation we find invaluable in our tireless efforts to continue providing the best accommodations and guest services in Key Largo. Everything was very efficient. I have no subpages tigons. Everything was well thought out. The facility was very nice. Loved the pools.